Their Story- We had a love marriage. We met in Glasgow, United Kingdom during our Post Graduation. Namit and I became good friends within weeks of meeting each other. He was really easy to talk to and super fun to be with. We would talk for hours in a day. At a time when I most needed a friend, he was there by my side. And then somewhere down the lane, we realized there was something more to the friendship. One of our friends acted as a cupid and finally he asked me out on March 5, 2011; we had our roka in a year and got married after 2 years ! 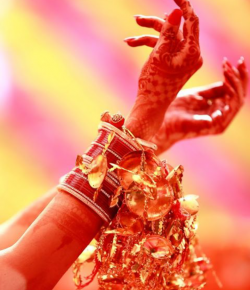 Wedding Tales-It was a lot of different cultures to deal with 😉 Ever since I was a kid I wanted a North Indian wedding, with loads and loads of dancing (I blame Karan Johar and Yash Chopra movies for that 😉 ). My parents were super chilled out and said that I could have a Punjabi wedding if that’s what I really want. So we had a Punjabi wedding and a Kerala style reception. Trousseau Tales- For my Sagan & Ring Ceremony I wore a red and golden Dolly J lehenga. Namit’s mom and sister picked it up for me, from AZA for roughly under 2 Lakhs (though we got a 50% discount on it). For my Mehendi & Sangeet, I picked up a pinkish-peach Varun & Nidhika floor length anarkali, from AZA for around 40-50K . For the wedding, I wore a Rimple & Harpreet Narula lehenga, also from AZA. I wore a magenta kancheepuram saree for my reception in Kerala, which I got from Jayalakshmi Silks, Kochi. WHo did your makeup and who shot these beautiful pictures? My makeup for Sagan & Sangeet was done in Vidya Tikari Studios at Lajpat Nagar..The makeup artists were fantastic.. I did not want very heavy make up for any of the functions. And they did a fantastic job in keeping the makeup light and natural. My wedding makeup was done by Shalini Singh. She did an amazing job and she was super easy to work with. I did not want to be caked up with heavy makeup…and Shalini really got what I wanted and did a fantastic job.. The photographer we hired was from Dipak Studios. They did an amazing job in capturing all the candid moments. The reception in Kerala was covered by SL Anand. He was really fun to work with; always coming up with innovative and fun shots. The makeup in Kerala was done by La Femme Salon, Thrissur. I wanted my look to be completely traditional, with jasmine flowers on my head and long braided hair. The makeup artists were really good and efficient and my makeup was done in an hour’s time !